Catering for up to 12 students at a time our courses, like our floral style, are relaxed and informal and are held in our barn where there is a little woodburner to take the chill off the air in colder months. Our workshop is based in the sleepy country hamlet of Magheramorne - a stones throw from the world famous Antrim Coast road and only 3 miles from the busy port of Larne. When I initially thought up the concept of flowerschool I wanted it to be completely different from other courses run elsewhere. It needed to feel high end, a real experience day, one filled with quality blooms and incredible food and so we have partnered with Jill at Maggies Working Kitchen for all our catering needs. Jill provides our classes with the most delicious tasty treats and those attending are full of compliments on her afternoon teas and lunches. We look forward to welcoming you along to our little piece of flowery heaven in the countryside. 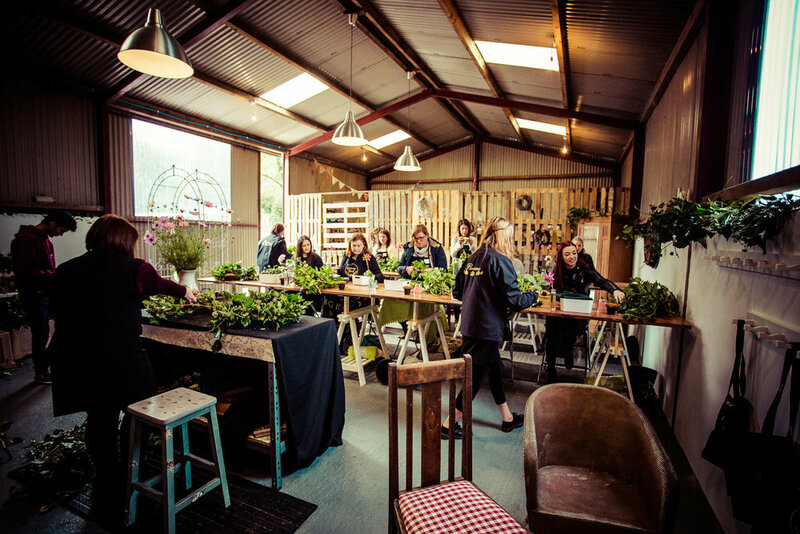 Here we run a variety of workshops and classes to suit everyone, from professional career florists wishing to upskill to absolute beginners and hobby florists wishing to try something new. We also offer Flower Crown workshops which are proving very popular for hen parties and team building outings. Thinking about booking a course or workshop? Send us a quick message and we'll get back to you with available dates. Thanks for enquiry. I’ll get back to you as soon as possible with an answer!